Art has been in evidence in Ireland from pre-history into the modern era. Though many may think only of the art of Irish Celts as Irish art, much of what has been done within the turmoil of the past few centuries in that nation have made their more recent artistic endeavors definitive as well. 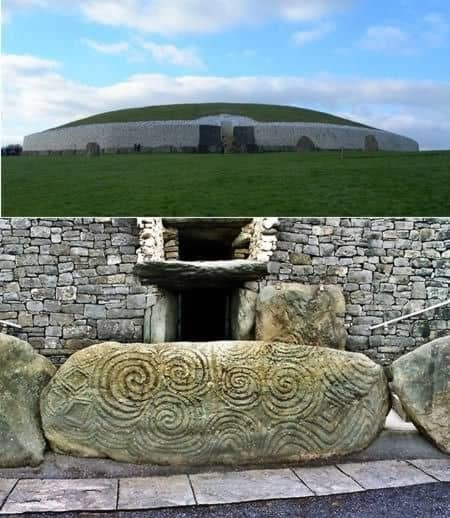 The story of the arts of Ireland begins in Newgrange where a megalithic tomb in County Meath was built around 3300 BC, predating Stonehenge. The intricate spiral carvings on the megalith are believed by some scholars to be the first ever map of the moon. Also at Newgrange are petroglyphs. Another megalithic structure at Knowth is an example of late Stone Age ceremonial and funereal architecture. Other Neolithic structures include the “long barrow”. The Bronze Age Irish created wedge tombs and artifacts from a people known as the Beaker culture. They were so named because of the shape of their drinking vessels. The Irish during this time became skilled at metal work and forged in gold, copper, and bronze. During the Iron Age, the Celts arrived and influenced the metal working of Ireland where weapons and tools were now being created with the additional medium of iron. 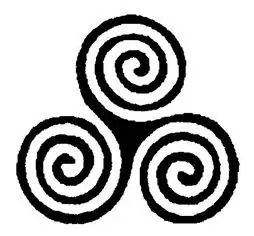 Celtic influences focused mainly on the La Tene Celtic style which was notable for its spirals, interlace patterns, and crosses. This would be the largest influence on Irish art for centuries. Because Ireland was never a province of Rome, Celtic art flourished untouched and survived the Roman period and Dark Ages without any degradation. Skill in metalworking, stone carving, and wood carving was practiced with diligence and craftsmanship. Irish metalworkers created exemplary religious items for Christian churches and monasteries as well as secular art for private patrons. St. Patrick came to Ireland in part because of its remote location. The rest of Europe was under siege from barbarians and the Dark Ages were impeding the spread of Christianity. Church leaders felt Ireland might be a safe haven from which to spur resurgence in conversion. Ireland became Christianized and many monasteries popped up, and along with them, illuminated manuscripts of heightened quality. 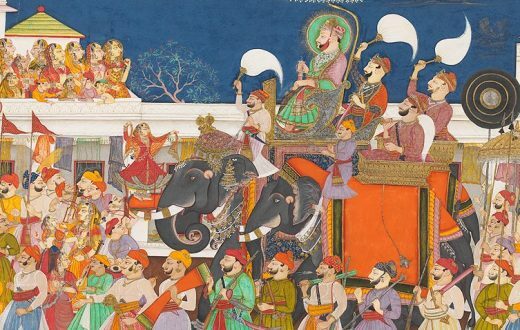 Illuminated manuscripts were highly decorated religious texts, namely Biblical art, that were lavishly done in golds, blues, and purples, and other luxury pigments of the day including those made from gold and silver. 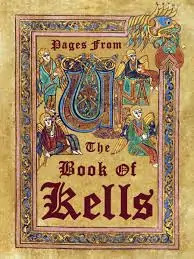 The most famous illumination of Ireland is The Book of Kells. 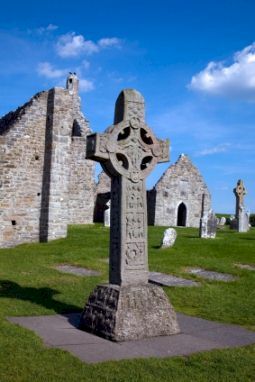 Monasteries also created sculptures in the form of Celtic High Crosses, which are among the most prevalent monuments and sculptures in Ireland, and also the most numerous at the time of any type since the Roman Empire. There were two main types of high crosses. One featured abstract interlacing, La Tene animal interlacing, and key and fret patterns. The second type featured biblical scenes. Because of growing conflict amongst the nations of what would become the British Isles, Ireland was too poor and in too much turmoil to produce any great art between 1200 and 1650. 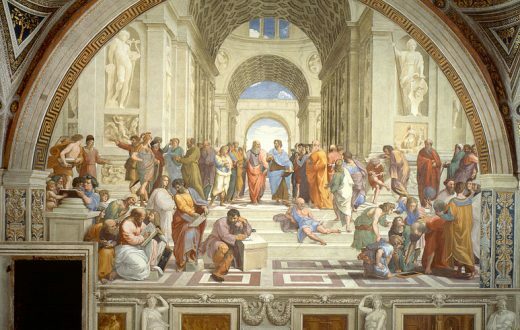 Art in Ireland was revived around the time of the founding of the Royal Dublin Society and the Royal Irish Academy, institutions that fostered cultural achievement. Artists began to paint fine landscapes and portraits. Beginning around 1830, Ireland’s greatest artists, mostly painters, chose to emigrate, either for professional reasons or because of the strain of the Great Famine. Portraitists gathered mainly in London, while many landscape painters converged in France. Because patronage could not sustain the artists of Ireland, even those who remained were unable to create large bodies of work and so this period was mostly bereft of Irish art created in its own land. As Ireland began to recover, Dublin patronage and art education increased. The Celtic Arts Revival movement was beginning and under all of the aforementioned conditions a new group of talent emerged and formed an active group of local artists. On their heels, a younger generation of artists that had their eye on the International art scene brought avant-garde techniques, themes, and philosophies to the Irish art culture, forming the Society of Dublin Painters. With the war on in the 1940s, Ireland’s art scene went into decline yet again as patronage broke down and artistic authorities rejected the ideas of modern art. The Royal Hibernian Academy was in charge of the major exhibitions through which artists gained commissions and therefore, they were able to control what was art and what was not through their strict rejections. They wanted art to retreat from the Fauvist, Cubist, and Expressionist bent in which it was going and return to the realism of the Renaissance. They were so against modern art that one gallery would not accept anything created after 1875. Artists rebelled in 1942 after a work by Louis le Broquy was rejected as a reaction to Mainie Jellett’s attack on the Royal Hibernian Academy. A group of Dublin artists formed the Irish Exhibition of Living Art the next year, giving Irish artists an annual showing of their work without the strictures of the RHA. Their goal was to show the work of Ireland’s living artists. Much of Irish art in the remaining part of the 20th century up to our time comments on the political, religious, cultural, and social upheaval of the nation, whether that is expressed through traditional or modern art. Because so many Irish artists emigrated during the years before, during, and after the potato famine, there are very few pictures that record that tragedy. A few exceptions exist, one being ‘The Irish Peasant Family Discovering the Blight of Their Store’. The artist, James Mahony, was hired by The London News Agency to travel to West Cork, where the toughest of conditions existed. Much of Celtic Revival art would lead us to think that Celtic jewelry would have been bulky and masculine, but it is quite the contrary regarding the La Tene style, which preferred curvilinear design and delicate curves and spirals.